I don’t have to imagine when wondering what Heaven will be like and I don’t have wonder if it is for real. Heaven is explained throughout scripture and I truly believe I witnessed first hand my mom being welcomed into heaven. I really no longer have to imagine what Heaven will be like, I have scripture to tell me what it will be like. I found myself sitting in the hospital one last time. With my dad sitting quietly beside my mom’s bed and me standing on the other side. Over 20 years my mom had carried the burden of cancer but this particular morning cancer no longer had a hold on her. Her body was worn out but God had given us such an amazing gift. Just the week before, mom was off of her meds and the family was all gathered all week long at our parent’s home. She was alert, talkative and even wanting to spend every moment with her family. There was no medical explanation of how she was being sustained and able to be up and still pouring into our family. This was a testimony of how God can heal, even if it was just for a short time. So back to my glimpse that lets me know Heaven is going to be amazing. Dad and I were standing on either side of the hospital bed. Mom was struggling. We knew we only had a few more minutes of her being here on earth with us. Dad and I were just praying that she would go peacefully and the pain would stop. At that moment mom squeezed my hand and turned her head toward my father. Her eyes had been closed all night but they popped open and were bright. I could tell she was looking past my dad. This is the part that that sealed any questions for me. She said just two words. Oh, George. It wasn’t said in fear, disappointment or even sadness. It was words of amazement. Her tone was as if she was in awe or amazement. I knew at that moment, she saw the opening to heaven. She was being greeted and taken to heaven. I will cherish this memory that I got to share with my dad and my mom forever. But not everyone gets to share this experience and we all need to not rely only on our emotions and experiences to be the truth. We have to read the scriptures for ourselves and see what Heaven is going to be like. My dear friends and ones that I trust to teach truth have developed a study called. Heaven by the book, More than I can imagine. The thing I really like about this study is that everything is based on scripture only and it guides you to dig in yourself. Have you ever found yourself sitting an imagining what Heaven will be like? Our Bible answers so many questions about heaven and it opens up our minds to what eternity with Christ will be like. With this course, you will get 6 sessions plus a bonus. Lesson One: If Heaven Is Real, Why Doesn’t Everyone Want to Go? Lesson Two: God’s Presence: Should I Be Excited or Petrified? Lesson Six: Isn’t Everyone Going to Heaven? Bonus Lesson: The End of This Age: The What, the When, and the How? When you purchase this course, you can view it as many times as you want and use it to lead other through this study as a group. You also get personal communication with the author of the course as well as put in a community of others through Facebook to where you can have a community that is learning together. Les and Page along with Meanwhile Ministries want to give everyone quality studies that encourage you to grow deeper and to find God’s instructions and promises by reading the Word for yourself. This study does just that. Heaven by the book, More than I can Imagine is such a comforting study that gives us hope and reassurance. Check out this study, spend some time looking at the content. 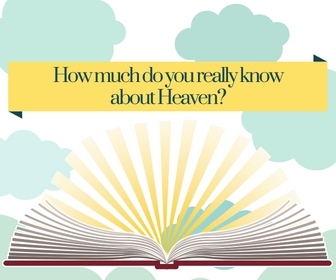 I truly believe you and a group of ladies would love to study Heaven By the Book, More than I can Imagine.